Directed by Robert Wise (Day The Earth Stood Still, The Andromeda Strain). All the old gang is here: William Shatner (Captain Kirk, now Admiral), Leonard Nimoy (First Officer Mr. Spock), DeForest Kelley (Doctor "Bones" McCoy), James Doohan (Scotty), Nichelle Nichols (Uhura), Walter Koenig (Chekov), George Takei (Sulu), Majel Barrett and Grace Lee Whitney. Guest stars: Mark Leonard (as Spock's father), Stephen Collins (new Captain of the Enterprise), and Persis Khambatta (his sensuous friend, duplicated/taken over by an alien in the movie). The old crew of the new Enterprise is on board to see off a shakedown cruise, when a huge cloud destroys three Klingon battle cruisers and a Federation space station. Enterprise is the only ship in the area, so is sent off to make contact with whoever or whatever it is. It turns out to be an alien space probe that calls itself V'Ger (after colliding with an old Voyager space probe from the 20th century - shades of "The Changeling" episode). Now determined to return to Earth and find its (Voyager's) creator, it is unwilling to accept that mere humans (carbon units) create machines. Robert Wise uses the 1950s sci-fi formula (where it took half the movie for the plot to get going), and half-way through the MonsterVision showing of ST:TMP, the host said, "Now you can see why Trekkers were starting to squirm in their theater seats by this point...you have to call them Trekkers. You call them Trekkies and you get mail." Anyway, as long as it is at 132 minutes, some important stuff was cut out for the theater version and the 143 minute TV & video version is better. Majestic score by Jerry Goldsmith, screenplay by Harold Livingston from a story by Alan Dean Foster (a sci-fi writer who also novelized all the Star Trek Animated episodes). Special effects by Doug Trumbull. Directed by Nicholas Meyer. After the disappointing box-office of the first movie, production of this one was turned over to Paramount’s TV division, which naturally made it a sequel to one of the original TV episodes; Space Seed. In the late 1990s, DNA manipulation has produced a race of genetically superior humans. Led by Khan Singh (Ricardo Montalban of Fantasy Island), they take over the Enterprise in the 1960s episode after being revived from a cryogenic deep-freeze in a “sleeper ship.” They were eventually overthrown by Kirk & crew, who exile them along with a female Federation historian who sided with Khan. When the movie starts, the Enterprise is fooled into going into the Neutral Zone, where an armada of enemy Romulan ships destroys it. After the original Enterprise bridge crew is wiped out, everything shuts down and Admiral Kirk makes his entrance. It was a simulator, designed to test the metal of new Enterprise ensign Lt. Saavik (Kirstie Alley of "Cheers" and MonsterVision movie Look Who’s Talking Too) in a no-win situation. She is told by Spock (in Vulcan, with subtitles), that cadet Kirk had survived the same test by hacking into the simulator computer and reprogramming it to allow a solution. This was also the first scene in the movie for another reason: there was a suspected spy on the movie set so the script for this first scene was left where he/she would find it. When tabloids came out proclaiming that the original crew of the Enterprise would be killed off in the new movie, they had their proof while misdirecting fans from the real plot at the same time. Anyway, Chekov has left the Enterprise and is now First Officer on another ship. He and its Captain (Paul Winfield, the police Captain in Terminator) are captured on a desert planet by Khan, who is “older and more bitter.” He puts nasty little alien creatures in their ears which “wrap themselves around the cerebral cortex... rendering the victim extremely susceptible to suggestion.” Ordered to kill Kirk, Winfield instead manages to turn the phaser on himself. Chekov fights it in his mind and passes out. The thing crawls out and McCoy kills it. But by now, Khan is long gone, plotting revenge aboard his newly captured Federation starship. I would tell you who plays Khan’s new right-hand man, but his name was taken off the credits when it was in theaters because he and his agent were afraid of sci-fi typecasting. Leonard Nimoy had himself been such a victim of typecasting that filming had already begun on the first movie when he finally agreed to do it, requiring the new vulcan on board the Enterprise to be killed off in a transporter accident and a new scene written in starring Mark Leonard as Spock’s Ambassador father. Nimoy agreed to be in “Star Trek 2” on the condition that Spock be killed off at the end. This caused something of a problem when he changed his mind and agreed to be in the third movie, which then ended up essentially starring him. Anyway, the good guys win and “The needs of the many outweigh the needs of the one” when Spock enters a radioactive chamber to bring the Enterprise warp drive back online just in time to escape the Genesis device exploding a solar system, then dies. Producer: Robert Sallin, Exec. Producer: Gene Roddenberry, Screenplay: Jack Sowards from a story by him and Harve Bennett. Special effects by Lucasfilm’s Industrial Light & Magic. Music by Alexander Courage (who also did music for the Star Trek TV-series as well as many other classics at Paramount TV) and James Horner. Not bad, but rarely at the top of anyone’s favorite Star Trek movies list. It turns out that Vulcans can pass their mind on to another person before they die, and the planet Vulcan never told humans about this little detail. Dr. McCoy is the unwitting host, and that DNA from Spock’s dead body on the new Genesis planet is now growing into a new, mindless Spock clone on the rapidly evolving planet where they left the casket at the end of ST2. There is a huge cast including a new Vulcan (Robin Curtis), a Klingon ship captain/villain (Christopher Lloyd of Back To The Future and both Addams Family movies), and Dame Judith Anderson reprising her role from the 1960s episode Amok Time, along with Mark Leonard as Spock's ambassador father. The crew steals the Enterprise* to find Spock's body before his mind expires inside McCoy. Meanwhile, a renegade Klingon (Lloyd) wants the Genesis "weapon" that can create or destroy whole planets, and kills Kirk's son as an example (this will later become a plot point in Star Trek 6). Complicating things is that anything the Genesis device creates becomes unstable, and the planet may fly apart any moment. While not a great movie, it is similar to the plot of original episodes, so Leonard Maltin says, "recommended most heartily to Star Trek fans." The Enterprise crew takes over the vanquished Klingon warbird (I won't tell you what happened to the Enterprise), and flies it to the planet Vulcan to hide out and make repairs while the writers come up with the movie script for Star Trek 4. Directed by Leonard Nimoy. After much fan speculation that Kirk would be court-martialed for stealing the Enterprise out of drydock, ST4 sidestepped the issue by having Earth itself being threatened by a new and powerful menace. Kirk and crew are on Vulcan staying with Spock's parents (Mark Leonard & Jane Wyatt), and start to head for home in their captured Klingon warbird. The Admiral of the fleet (Brock Peters, who played Darth Vader in the Star Wars radio series) warns them away because Earth is being ripped apart by audio waves. Spock figures out the audio is meant to penetrate Earth's oceans to communicate with a now-extinct species of whales. So they take the Klingon ship back in time to present-day San Francisco to look for a pair of humpback whales to repopulate 24th-century oceans and communicate with the alien space probe. There they meet a 20th century marine biologist (Catherine Hicks, the mom in monster movie Child's Play), who has been ordered to release a pair of them. Spock freaks her out by using a mind-meld and saying that George and Gracie (the whales) are expecting a little one. Meanwhile the Klingon warbird is sitting on the grounds of Golden Gate Park, invisble thanks to its cloaking device. They fill the hold with sea water but the whales are gone - they were released over her objections, wearing a tracking device. But a Soviet whaling ship is homing in on the convenient tracking device and is aiming a harpoon, so it becomes a race between the harpoon and the cloaked warbird, which then materializes between the whaling ship and the whales. The Russians go home, where they presumably tell everyone about their frightening UFO encounter. Anyway, the Enterprise/warbird crew head back to the 24th century with their two whales. Directed & co-written by William Shatner. Success has a hundred fathers, failure is an orphan, as is this mess. Shatner says the studio gave him the basic script (of a renegade Vulcan who's Spock's half-brother, and who is nuts), and wouldn't let him change it. The half-brother is holding ambassadors hostage on a distant planet and the Enterprise rides to the rescue. This is not anyone's favorite Star Trek movie, including William Shatner - who appologized for it on talkshows. We waited 3 years for this? Directed by Nicholas Meyer, cowritten by him and Leonard Nimoy. 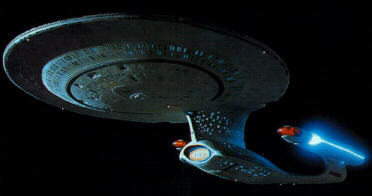 Starting with the seventh Star Trek movie (it didn't even get a number, indicating a new series, I suppose), the original cast was replaced by the cast of TV's "Star Trek: The Next Generation," which itself had left TV in May, 1994. William Shatner, at least, got an extended cameo in the cleverly titled "Star Trek Generations." In this one, Captain Picard and Captain Kirk take on a madman (Malcolm McDowall of Tank Girl and the new Fantasy Island) who wants to destroy everything using a time & space distortion on a remote planet. An odd movie with shades of ST5 - why would they want to remake a flop? Much better movie, a prequel to one of the original 1960s episodes. The inventor of warp drive is about to make his first trip into space. This will bring the attention of planet Vulcan (see title), and eventually lead to Earth and other planets creating the Federation. Unable to conquer Earth, the Borg decide to go back in time and prevent humans from ever venturing out of their own solar system. TVGuide.com says, "Picard and company follow the Borg back to the 21st century, where the Collective and its Queen (Alice Krige) are bent on changing Earth's history. The Borg's mission: stop inventor Zefram Cochrane (James Cromwell of "Babe") from taking the first warp-drive journey through space, thus preventing Earth's “first contact” with a benevolent alien race. Jonathan Frakes, who stars as Cdr. Riker, also directed. Data: Brent Spiner. Lily: Alfre Woodard. Worf: Michael Dorn. LaForge: LeVar Burton. Another oddball ST movie. In this one, Star Fleet wants to remove the peaceful Ba'ku people from a planet said to have "mystical powers." Since neither Picard nor the audience can understand why Star Fleet would do this, he rebels. Cinebooks on TVGuide.com says, "Director Jonathan Frakes breaks the curse of the odd-numbered Trek sequels with this ninth installment in the canon, which both departs from many treasured traditions and borrows liberally from the classic Western story of a small town's last stand against high-powered bullies ... As Ru'afo, the Son'a leader whose toxic blood oozes from his leathery skin when he's angry, F. Murray Abraham supplies a baroquely icky counterpoint to all the bonhomie. The supporting characters get short shrift, casualties of an unusually heavy story load for a Star Trek movie, but it's an interesting story, more accessible to non-Trekkers than previous entries. The enemies are less clear-cut than the implacable Borg, and instead of extra explosions, screenwriter Michael Piller offers complex political intrigue and double-dealing: Even the United Federation of Planets is no longer the familiar, homogeneously high-minded bastion of cultural altruism. Has Star Trek entered the age of The X-Files?" Captain Picard takes on a new Romulan leader in the 10th ST movie. TVGuide.com says: "The Enterprise crew learns there's more to celebrate than Riker and Troi's wedding: The Romulans want peace, and Picard is sent to their home planet to negotiate. There he meets the new Romulan leader (Tom Hardy), a human who has a mysterious connection to Picard---and a sinister agenda. Despite the slow pace and formulaic script, the 2002 adventure has good special effects, elaborate battle scenes and clever in-jokes about the franchise. Rated PG-13 for violence and sexual situations." An OK movie, but you would think that in 4 years they coulda written something better. Star Trek Animated titles list with my ep descriptions. When Commander Uhura takes over communications so the others can "steal" the decommisioned Enterprise and search for Spock in ST3, she tells the young communications officer, "This isn't real, this is fantasy." What Spielberg movie was this spoofing? "E.T. The Extra-Terrestrial" (1982), in which one of the little kids says, "This is real, not some fantasy like Star Trek." Every ST fan who had seen E.T. got the joke in ST3.